Made for the active and elegant woman, the TAG Heuer Aquaracer Two-Tone Mother of Pearl Watch WAF1424.BB0825 is classy yet extremely functional. 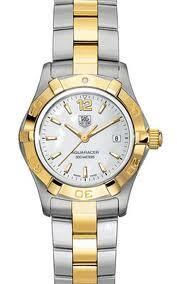 It reflects the quality and craftsmanship that is synonymous with the TAG Heuer name. The two-tone theme is perfect for the woman who likes to mix and match her accessories. The 18K gold bezel is sturdy and stunning at the same time. The case, at 27 mm in diameter, is substantial yet still small enough to accent a woman’s wrist attractively. Beautifully highlighting the watch face, the mother of pearl dial provides a clear contrast to the gold baton hour markers. The 12 o’clock marker is the numeral itself, and there is a date function at 3 o’clock. The TAG Heuer emblem under the 12 o’clock marker authenticates this as a true luxury watch. Made in particular for the active and sporty woman, the watch is water-resistant to 300M (985 ft.) The luminescent hour markers and hands provide a bit of light when swimming in the evenings or diving into the depths. The unidirectional bezel is also perfect for activities that need a timer. It has six large studs, which makes it easy to manipulate, even in the water. The watch has few drawbacks. In fact, while some luxury watches are not easily readable, this design provides ease of reading and timekeeping. Because of that, it is also extremely functional, which is also hard to come by in other luxury watch models. The two-tone theme of the watch may be its only weakness, and then it would only be negative for some people. Both of these options are as elegant as one would expect from a name like TAG Heuer and run about $300 less than the two-tone version. The two-tone Aquaracer retails at $2,000 but is available from several online retailers for under $1,500. If you’d prefer to buy your watch from an authorized TAG Heuer retailer, you can find locations near you at tagheuer.com. The TAG Heuer Aquaracer Two-Tone Women’s Watch is an amazing timepiece that combines design, functionality, and quality. It provides the elegance necessary for the boardroom and the practicality necessary for sport. For the active career woman, there is no equal.